It is said that from the darkest clouds come the brightest lightning. After Aaron Vaughn, a Navy SEAL on SEAL Team 6, was killed when the team’s helicopter Extortion 17 was shot down in Afghanistan, the Vaughn family was absolutely devastated. Yet out of the family’s grief has developed a bright light of healing for the children of fallen American war-fighters. 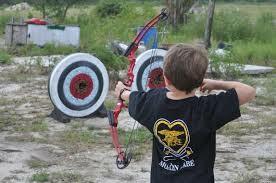 Kids come from all over the country to enjoy activities from fishing, archery, horseback-riding and much more. Mothers are put up at a nearby hotel so that they can have a relaxing weekend themselves and also remain close by in case they are needed. The first camp last April was a tremendous success and consisted of just ten little boys. The next one, the foundation’s third, begins on November 22nd will have 21 boys and 7 girls. The Gator Boys will spend the weekend with the kids for some “full-out crazy-time fun for the kids,” as Karen puts it. Please help us to spread the word about Operation 300 and go to their website and donate as generously as you can. Find them at Operation300.com, on Twitter at @Op300 and on Facebook.com/Operation300. Jude, thanks for this article. I had not heard about this camp. It sounds wonderful and needed.